Dolley Payne Todd Madison (May 20, 1768 – July 12, 1849), wife of President James Madison, who served from 1809 until 1817. She also occasionally acted as what is now described as First Lady of the United States during the administration of Thomas Jefferson - fulfilling the ceremonial functions more usually associated with the President's wife, since Jefferson was a widower. She was born in New Garden, a Quaker community in what is today Guilford County, North Carolina, on May 20, 1768, a daughter of John Payne, a not-too-successful farmer and erstwhile starch manufacturer, and his wife, Mary Coles. She spent her teenage years in Philadelphia, where she married on January 7, 1790, John Todd, Jr., a lawyer who was instrumental in keeping her father out of bankruptcy and who found Mary Payne a position as the manager of a boarding house. The couple had two sons, John Payne (1792-1852) and William Temple (b./d. 1793) Her husband and their younger child died in 1793 in a yellow fever epidemic. 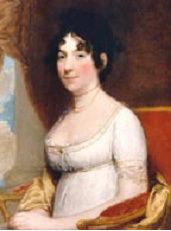 Dolley Todd married James Madison on September 14, 1794. The couple had been introduced by a mutual friend, Aaron Burr, who was a frequent guest at the boarding house managed by Mary Payne. The location of the wedding was a Virginia plantation owned by the bride's brother-in-law George Steptoe Washington, a nephew of the first president of the United States. The Madisons had no children but raised Dolley's son from her first marriage, John Payne Todd, whom they called Payne. Unfortunately, the child grew into a profligate young man addicted to gambling, a habit that resulted in his mother's eventual impoverishment. During her husband's political life, Dolley Madison was noted as a gracious hostess, whose sassy, ebullient personality, love of feathered turbans, and passion for snuff (tobacco) seemed at odds with her Quaker upbringing. However, probably her most lasting achievement was her rescue of valuable treasures, including state papers and a Gilbert Stuart painting of George Washington, from the White House before it was burned by the British army in 1814.